Robert J. Dole VA Medical Center is located in Wichita, KS and serves more than 30,000 veterans across 59 Kansas counties. In our work for Robert J. Dole VAMC, Health Facilities Group has made multiple improvements to the infrastructure that supports our veterans and their families. HFG learns from every project and our experiences at Robert J. Dole VAMC have strengthened our already extensive track record of cooperation with the U.S. Department of Veterans Affairs. Health Facilities Group excels at empowering medical professionals through state-of-the-art medical planning and architecture. Through these services, we are proud to have supported Robert J. Dole VA Medical Center in its mission to provide the men and women of the U.S. Armed Forces with the best possible healthcare. 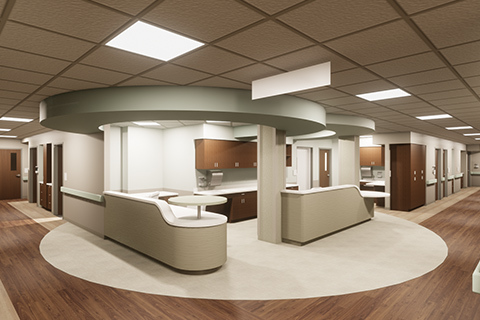 Health Facilities Group led the Design-Bid-Build team that provided the Robert J. Dole VAMC with services for its 13,500 SF Sterile Processing and Surgical Suite Addition. This included the creation of the drawings and specifications to expand the existing Surgical Suites and Sterile Processing Service (SPS) site location, which was adjacent to the existing locations of the Surgery and SPS. The design included structural components with supporting calculations; site location/floor plan programming; the maintenance of patient access routes/flow patterns during the construction phase; required submittals; and construction estimates of probable costs to construct/renovate two additional Ortho Surgical Suites and new Sterile Processing Service (SPS) to accommodate all other surgery and SPS services. HFG’s team located all existing utilities within site location and determined the connection locations that met the needs of the proposed project. This included size, configuration, and locations of proposed utilities in relation to existing utilities in order to eliminate conflicts and relocations to the greatest extent possible. The exterior finish of the proposed building was brick and mortar that matched the existing structure. The design included the necessary fire protection and detection; heating and ventilation/air conditioning (HVAC); plumbing (supply and waste); electrical service to connect to the existing emergency back-up generator; interior/exterior lighting; and monitoring connection to the existing Direct Digital Control (DDC) building automation/alarm systems. HFG is also responsible for Construction Phase Services, including submittal reviews, transition planning, quality assurance inspections, and site visits. Other projects include a multi-phased remodel; USP <800> Pharmacy relocation; patient privacy renovation; elevator feasibility study; and gutter and woodwork replacement.